Addition and subtraction are important skills that children must learn and master early on. Strong addition and subtraction skills can be a big help during the later part when the math problems become more complex. Subtraction can be quite challenging for kids and it may take years for some to fully master it. However, with constant practice, it will not be so hard at all. Kids need to learn what happens to a group of numbers when there are some that are added or taken away. With the use of subtraction strategies, kids can understand subtraction concepts and memorize math facts faster and easier. Kindergarten math teaches kids the concept of subtraction by using the terms take away, left, minus, and similar terms. Subtraction activities for kindergarten kids must be fun so that they can learn more because this is important for all kinds of computation. Having a solid understanding of the concepts of subtraction is a good foundation for division and fraction at a later stage. Since subtraction is more challenging, children may find it harder to learn. With an addition, you start from a small number and count upwards. With subtraction, you start with a larger number and take away some. Kids have to count backward and it is for this reason that subtraction is trickier. To help kids with subtraction, there has to be a strong foundation of addition concepts since addition and subtraction are closely related. The stronger the addition skills, the easier subtraction will be for a child. Point out the connections between addition and subtraction. Show the clear relationship between the two so that the child can grasp it more fully. By repetition, drill, and memorization, the knowledge on subtraction can become automatic because they will soon develop speed with constant practice. Different kids learn in different ways. Find what works best with the children and teach according to their learning style. Learning apps can help children learn more even when they are not in school. While there are different opinions about a child’s screen time, there is no question that learning apps can help improve a child’s skills in math. When a child uses a mobile app, there are no timetables to follow. They can practice the same concept over and over again until they master it. 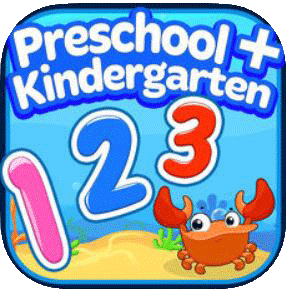 During the fun time, instead of playing with other games, kids can make use of the fun math apps. They are engaged and at the same time, they can learn and enhance their math skills. Free time is used wisely. Using mobile devices, smartphones, or tablets can make a child confident in using other technology and gadgets in the future. Shy students can make use of technology to make themselves heard. Traditional homework can be boring. But homework using learning apps can be a lot of fun. More children will participate and the lesson is more interesting. Since the learning apps are interactive, parents and teachers can keep track of the kid’s activities. They can check the progress and evaluate which areas need improvement. Kids are not restricted by location. They can access the math apps anytime and anywhere. Even if you are traveling, or waiting somewhere for quite a while, the apps can be easily accessible and kids do not have to stay away from learning for a long time. This app lets a child build and strengthen math skills while keeping them entertained at the same time. There are 9 interactive games that teach kids concept on patterning, counting, addition, and subtraction. The levels are adjusted according to the player’s progress. Other skills that a child can learn from here is arranging numbers in sequences and determining patterns. A child will surely learn and have fun at the same time. Add it up and take it away lets a child use his addition and subtraction skills to solve math problems. Crab assistants provide multiple-choice options. The good thing about this app is that as long as the player wants to use it, the play can go on. The cute monkey guides can engage a child for an extended period of time. This is an early learning game for preschool and kindergarten pupils so that they can have a head start on the basic math operations such as addition, subtraction, counting, shape identification and matching skills. Kids can learn from up to 5, then up to 10. This app comes with shapes and geometry. 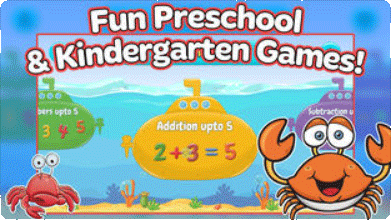 This app has an ocean animals theme that helps make math more fun. Mathlingo is good for everyday learning whether you are at home or in school. Mathlingo features tapping sea animals to start learning to count. Counting involves determining which group has more animals as well as counting cute ocean animals. In addition and subtraction, there are cute pictures shown and fun math puzzles that kid will surely enjoy. Moose Math engages children in a math adventure by teaching them addition, subtraction, counting, sorting, geometry, and many more. Equipped with cute and fun graphics, this app has 5 multi-level activities where children can get rewards to build a city or decorate buildings. Parents and teachers can monitor progress and determine other skill-building practices. Moose Juice activity is making smoothies while practicing counting, addition, and subtraction. Pet Bingo is where children try to solve addition, subtraction, and counting problems so that they can get BINGO. It is important to develop the mathematical skills of children during their early years. Having a strong foundation on math will allow them to tackle and solve more complex math problems as they advance in school. Practice and repetition of the different math concepts can make the preschoolers and kindergarten develop strong math skills.